To give you an idea of what 5% of your total calories looks like, check out this chart to see how many grams of Added Sugar this means for you each day. And, if you’re just starting out on your sugar reduction journey, you may find this post about Hidden Sugar helpful. If you have already taken the leap to slash sugar out of your eating plan, you have likely experienced the shock and awe of how much sugar is in your favorite foods. This, then, is usually followed by frustration when you try to determine how much of that sugar is Added Sugar versus Natural Sugar. When I work with clients to reduce their sugar intake a few questions naturally arise. Let’s look at these questions closely. How do I tell how much Sugar is in my favorite packaged foods? First, check the Nutrition Facts label to see how many grams of Sugar per serving the food contains. You do this by checking the line under Total Carb that says Sugars. While perusing the label, be sure to also check the serving size and number of servings per container to ensure you are eating only one serving. The grams of sugar listed are for one serving and sometimes the servings per package may be more than one. Next, check the Ingredient List on the package for different names of sugars. Did you know there are over 56 different names for sugar? Become familiar with this list so you can easily recognize when sugar has been added to your food. Sometimes you might see 5 or 6 different Added Sugars listed on an Ingredient List like this one below. This is a big clue that most of the sugar grams on this Nutrition Facts label are from Added Sugars. Another clue is where sugars fall in the Ingredient List. By law, ingredients in the Ingredient List are listed in descending order of prevalence by weight. 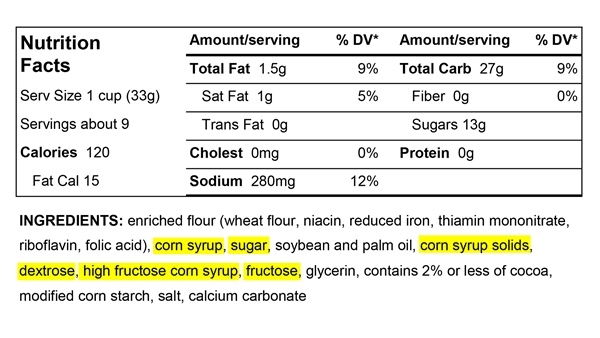 So, if sugar is one of the first 3 ingredients, then likely, most of the grams of sugar in that food are from Added Sugars. At this point, many clients often ask "What about Natural Sugars? Do I have to count Natural Sugars in my daily Added Sugar allotment? 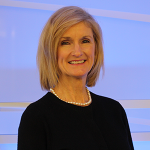 And, how do I determine if the sugar listed on the Nutrition Facts label is Natural Sugar?" This part is a little tricky. So, it helps to know a few key points. Added Sugars are sugars from external sources that are added to a food or recipe. They do not occur naturally in the food so they are counted in your daily Added Sugar allotment. Natural Sugars are sugars that occur naturally in a food. Natural Sugars occurring naturally in a food are not counted in your daily Added Sugar allotment. 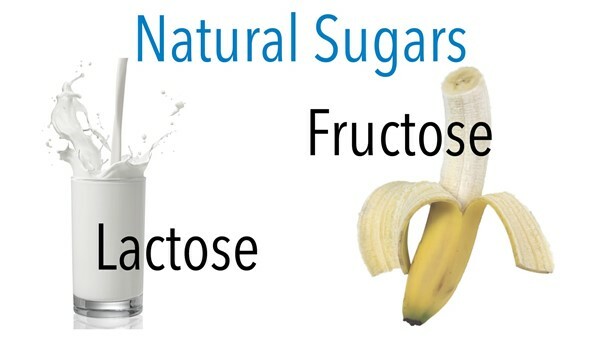 There are basically 2 types of sugar that naturally occur within a food: Lactose (milk sugar) and Fructose (fruit sugar). 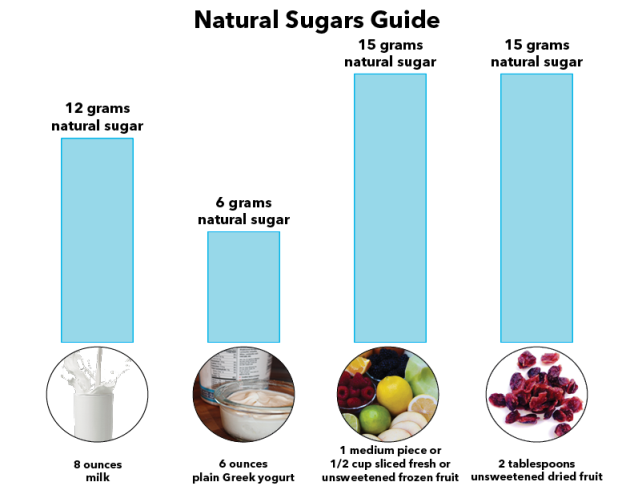 Using the stats in the table below can help you identify grams of Natural Sugars on the food label. Crystalline Fructose granules can now be purchased in the supermarket and are used to sweeten some “healthier” packaged foods in health food stores. 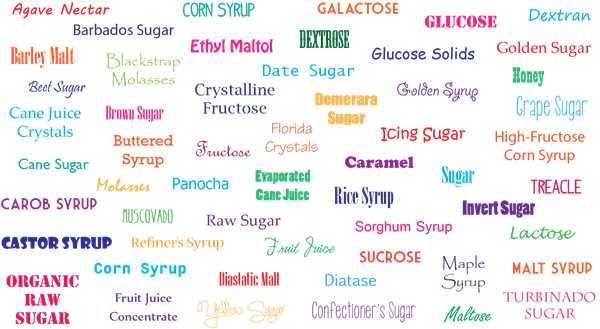 If fructose is listed in the Ingredient List, then it is not naturally occurring IN the food so it is an Added Sugar. Fruit juice is the natural sugar extracted from fruit. When you eat a piece of whole fruit, there is only a small amount of juice (fructose) in the piece of fruit. But, once you extract the juice from multiple pieces of fruit to make one glass of juice you end of up with a glass of “sugar”. So, fruit juice is considered an Added Sugar (whether you’re drinking it or using it in a recipe.) One 4 ounce glass of juice counts as 15 grams of Added Sugar. Yikes! 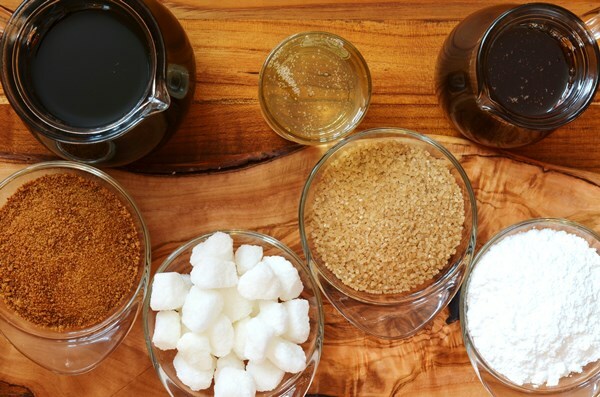 Natural sugars like honey, maple syrup, molasses and agave nectar are naturally occurring but they are simple sugars added to foods so they count as Added Sugar. One teaspoon of either contains about 4 grams of Added Sugar. Follow these tips to reduce added sugars in your foods so you can spend your daily Added Sugar allotment the way that’s the most fun for you. 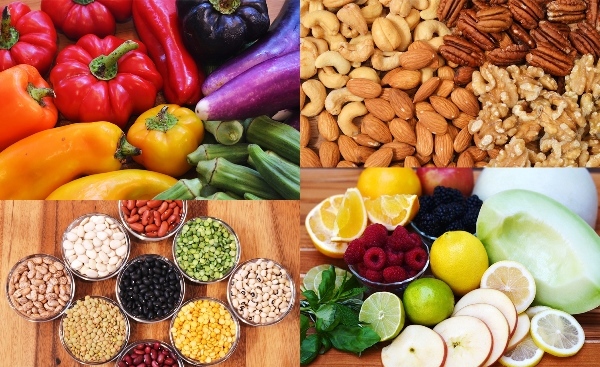 1) Eat mostly fresh, whole foods. Whole foods from nature do not contain Added Sugar. 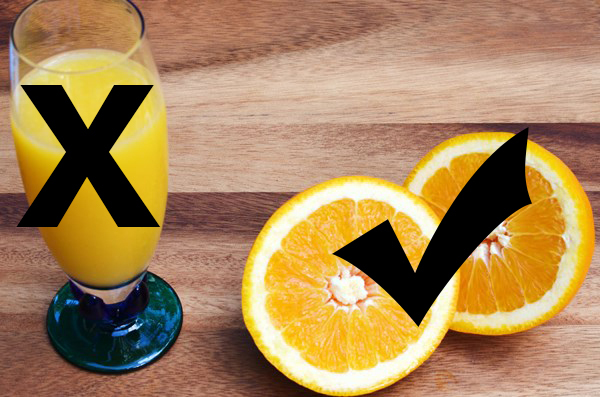 2) Eliminate fruit juices, even fresh squeezed, and opt for a whole piece of fruit instead. 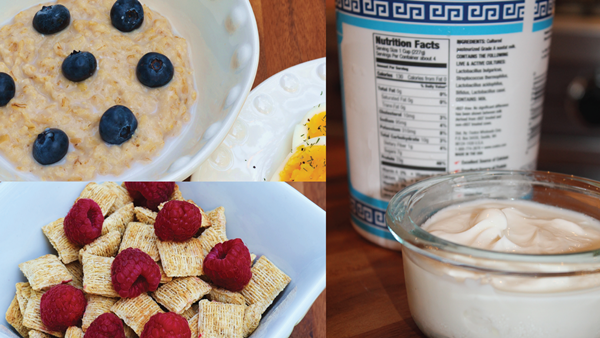 3) Buy unsweetened Greek yogurt and cereals. Then add fresh fruit for sweetness. 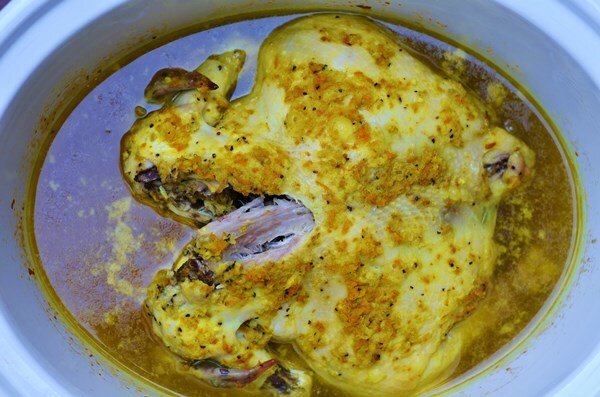 This super easy crock pot chicken recipe uses fresh turmeric and ginger which provide mild, exciting flavors and powerful phytonutrients. If using these unique spices in their fresh form is currently out of your comfort zone, substitute two teaspoons of the dried version of each until you get your feet wet with fresh spices. 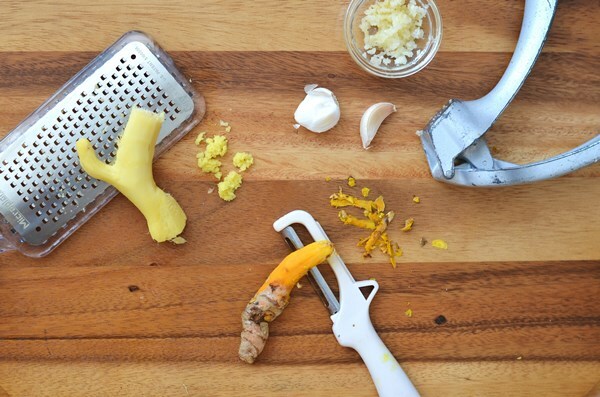 Once you see how easy it is to use fresh turmeric and ginger, you may never go back to dried. Peel turmeric and ginger with vegetable peeler and grate with a fine grater. Mince garlic. Season the chicken liberally with sea salt and pepper, making sure to season inside the cavity. 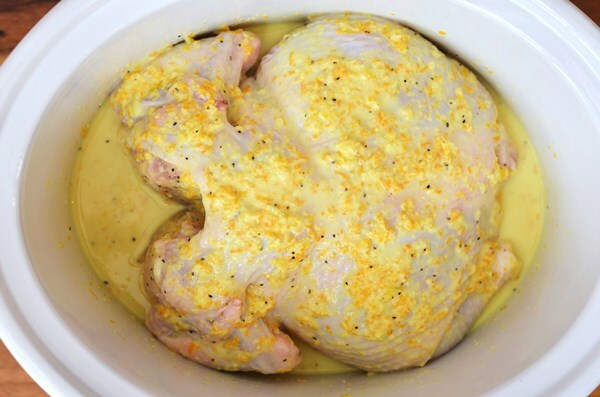 Place the bird in the slow cooker and spoon some of the mixture over the top of the chicken. Put the lid on and let it cook on HIGH for 4 hours or LOW for 6-8 hours. When the chicken is cooked, remove it from the slow cooker. Pull the meat off the bone and shred it. Reserve the bones for stock if you like. Discard the skin. Add the baby spinach to the hot liquid in the slow cooker and toss in the liquid until the spinach wilts (about 1 minute). 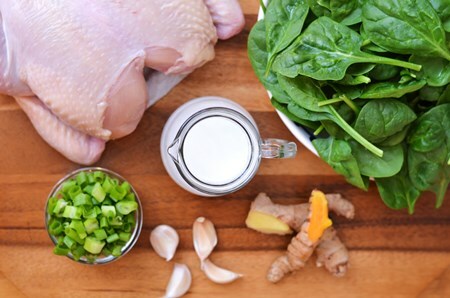 Add the chicken meat back to the slow cooker and stir together with the spinach and liquid. Taste and adjust for seasoning. 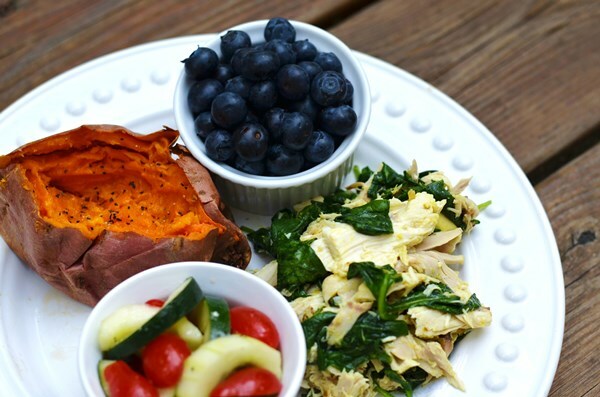 Serve with a baked sweet potato, cucumber salad and summer berries.